Although I didn’t see any of the Europa League action last night, I heartily endorse the idea of both Sp*rs and Chelsea going as far as possible in the competition. Hopefully they’ll go all the way to the final and wherever it’s held football holds its nose at the stink both teams make as the game erupts into on and off-field violence, culminating in a helicopter like Blue Thunder going into silent mode and spraying all the fans with Agent Orange and hippo piss while blasting Life is a Rollercoaster by Ronan Keating at top volume. That song is so indescribably awful it was probably secretly written by Phil Collins. I don’t care who wins it, once we get the rioting, shooting, the possible termination of John Terry as he pleads with fans who are so far gone they rip him limb from limb then use those limbs to beat Ashley Cole and Emmanuel Adebayor to a pulp. You see, you have to look at the bright side. The reality is that Sp*rs playing 120 minutes last night is hardly ideal preparation for their game this weekend against whoever it is they’re playing that I can’t be arsed looking up. If we can beat Swansea then it puts the pressure on and history has shown us that they’re not that good at dealing with pressure. If, and I realise it’s a fairly big if, we can get some momentum going, who knows? For our part we have a a difficult away game after a midweek Champions League tie, that’s usually a recipe for a scintillating performance and a good win, right? Make no mistake, Swansea will be tough, they’re riding high on the crest of a trophy winning wave and ordinarily they’re a tough enough side to play against. The interesting thing from our point of view is whether the manager sticks or twists with the defence he played against Bayern. Although Nacho Monreal may come in for Kieran Gibbs, the big questions are over Lukasz Fabianski and Laurent Koscielny. It would seem very odd if the manager made brave midweek decisions over both, got rewarded, then reverted to the players he felt needed to be left out in the first place. What kind of message would it send to both if, after a clean sheet against a team as good as Bayern, he dumped them back to the bench? So, unless there’s some fitness issue, I think both will play tomorrow against Swansea. He has changed a lot, there has been a complete mental transformation in Lukasz’s attitude. He is more vocal, has more authority and mentally he absorbs the pressure of the game much better. He has a huge talent, which we know all about. Sometimes to go out of the game for a while helps people to mature and think about their own game. It’s long been the story that on the training ground Fabianski has shown everything you want to see in a keeper. Great shot stopper, good distribution, brilliant reflexes, but when it comes to the crunch he’s been a bit Sp*rs when put under pressure. The howlers and the mistakes were not errors made because he’s not any good, but because his head wasn’t right. It’s too early for us to know if the change Arsene talks about has occurred, that will only become evident if he puts in consistently good performances, but it’s amazing how quickly things change in football. Even a few days ago the idea of Fabianski in the team seemed ridiculous and vaguely scary, now not so much. Of course one flap and it’ll be back to square one, but the manager had enough faith in him to throw him in against Bayern. Regardless of whether he was trying to send Szczesny a message, if Lukasz had made a mistake against Bayern it would have been the manager who copped the flak. People would have said ‘Oh, that’s Fabianski for you’, but the weight of criticism would have been heaped on the manager for picking him in the first place. Perhaps I’m reading too much into it, but something made a man who is usually pretty cautious take that risk – especially as he’s hardly renowned for his gambles paying off. Ultimately, if Fabianski comes in, does well, and grabs his chance, then it’s the team that benefits. If it wakes up Szczesny and we have two keepers really vying for the position then all the better. May the better man win, and be steady until at least the end of the season. Right, time for this week’s Arsecast and discuss the Bayern game, the performance, what it all means and where we go from here is the man from East Lower. You can subscribe to the Arsecast on iTunes by clicking here. Or if you want to subscribe directly to the feed URL you can do so too (this is a much better way to do it as you don’t experience the delays from iTunes). 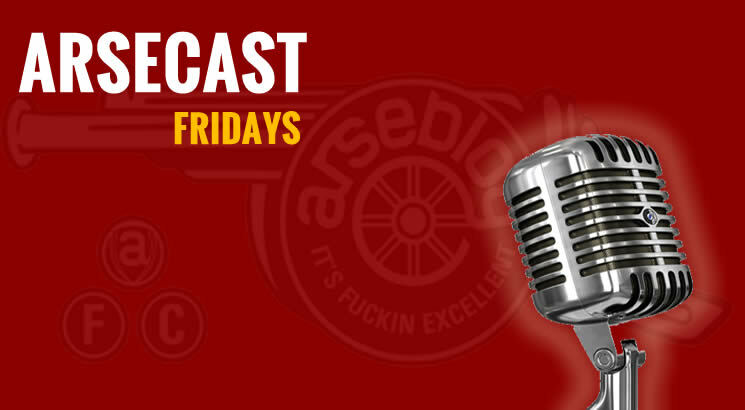 To download this week’s Arsecast directly – click here 19mb MP3) or you can listen directly below without leaving this very page. There is, of course, a pre-Swansea press conference, which should be interesting in the wake of Wednesday’s game. We’ll have news and info from that over on Arseblog News throughout the day. Back here tomorrow with a full preview of the game and all the usual bits and bobs. Until then, have a good one.